At least 34 people have been killed in flooding and 178,000 have been left homeless in China . The highest death toll in the rains, which started Thursday, was in crowded Guangdong province in the southeast, where 14 people were killed and four were missing, the Xinhua News Agency said. Deaths and damage were reported in areas throughout southern China and the northwest. In Guangdong, another 28 people were injured and 20,000 forced to flee their homes, Xinhua said. Guangdong is the heart of China's export-driven light manufacturing industries, but there was no word of any damage to factories or shipping facilities. In neighboring Hunan province, three people were dead, one missing and 158,000 left homeless, Xinhua said. 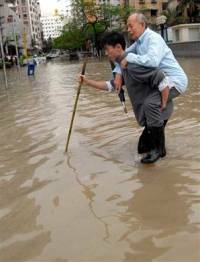 China suffers deaths and damage every summer when seasonal rains cause flash floods. Big cities are sheltered by giant dikes but fatalities are reported in farm communities that lack protection from rising rivers, and in mountain towns that are hit by flash floods. Millions of people in central and southern China live on flood-prone reclaimed farmland in the flood plains of rivers. Flooding and typhoons killed 2,704 people last year, according to the China Meteorological Administration. That was the second-deadliest year on record after 1998, when summer flooding claimed 4,150 lives. Elsewhere last week, two people were killed and 610 homes destroyed by floods in Guangxi, a poor, mountainous region to Guangdong's west, Xinhua reported, citing local officials. Thousands of students who were taking national university entrance exams in Guangxi had to move to emergency centers after school buildings were flooded, the agency reported. Rains in Guangxi destroyed 29 reservoirs, 362 embankments and 165 roads, and forced 59 factories to suspend production, Xinhua said, citing Chen Rundong, deputy director of the regional flood control office. In Sichuan province in the southwest, seven people were killed by hailstorms, lightning strikes and landslides, Xinhua said. In Guizhou, a mountainous southern province, seven people were killed and four more were missing, the agency said. It said 20,000 hectares (50,000 acres) of farmland were flooded and 3,000 houses destroyed. In the northwestern region of Xinjiang, a farmer was swept away by flood waters as he herded a flock of animals Thursday in the Yili region near the border with Kazakhstan, Xinhua said.